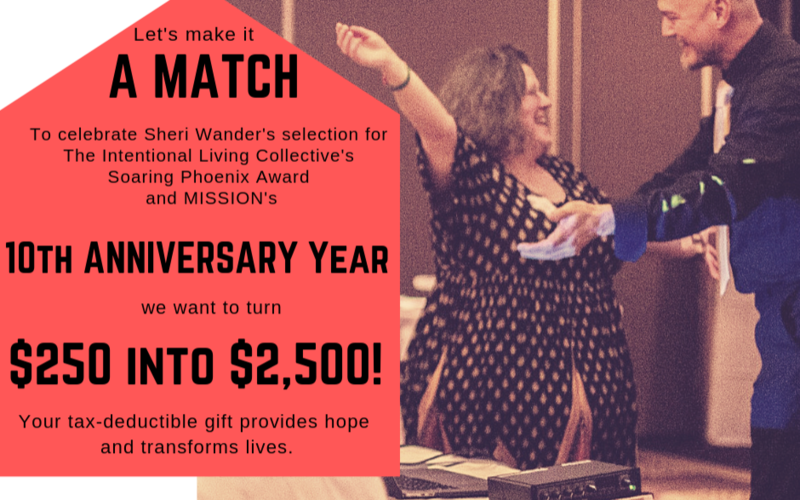 MISSION was honored to be gifted with $250 from our beloved Sheri Wander, recipient of a Soaring Phoenix award for 2019, and the Intentional Living Collective. To celebrate this achievement and our 10th anniversary year, we'd love to raise a 10X match! or 500 donations of $5 dollars! Your tax-deductible gift will go to fund the immediate and ongoing needs of members of our community who lack access to the basics - shelter, food, rest, and kindness. Your donation keeps the showers running, the laundry machines tumbling, the food hot, and the sleeping bags cozy. As spring beckons, we have a particular need for tents, tarps, and sleeping bags as winter services, including our own, come to a close and leave more people unsheltered. If you would prefer to donate these (new or used) items in person, we also welcome drop-offs of goods to our Daytime Warming Center host church until March 29. Come by between 9am and 4pm at 1900 Manchester Rd, Ann Arbor, MI 48104. If you would prefer to donate by check, please add "Soaring Phoenix match" to the comment line and mail your check to 3501 Stone School Rd Ann Arbor, MI 48108.